Toyohara Kunichika (1835-1900) Comparison of Flowers and the Twelve Months: November, 1880. Oban. This exquisite woodblock print is from a series comparing flowers and the twelve months of the year. This print is for November and the flower illustrated in the background is an orchid. The foreground picture is of the actor Kataoka Gado in the role of the Yakko, Ranpei. A Yakko was a footman serving a high ranked samurai, often having an important role in kabuki, helping the hero or the villain. Yakko costumes were always colourful and often accompanied by distinctive make-up. We can tell that this is a kabuki performance because Gado is pictured with distinctive kumadori kabuki make-up. 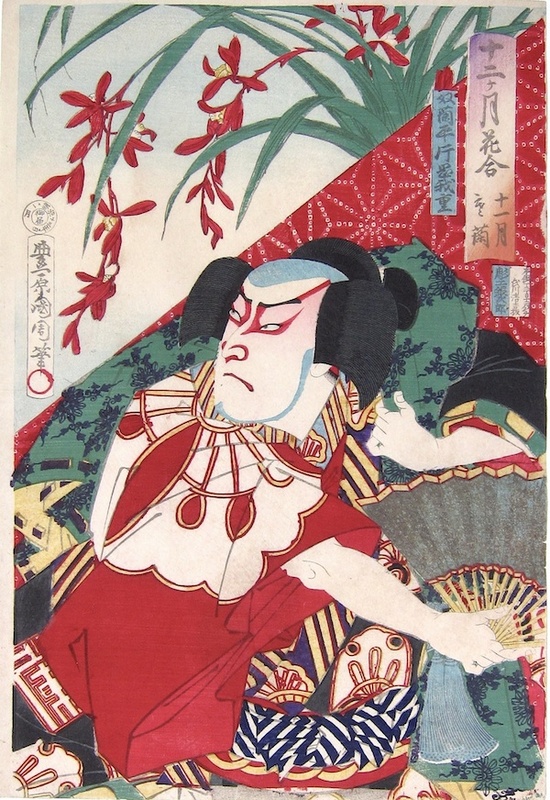 The red and white exaggeration of the features dates from 1673 and this particular style is called beni, expressing anger, indignation and forcefulness in a character. A fine impression of a deluxe print, with extensive embossing, burnishing and lacquer. Excellent colour and excellent impression. Full sized.